HAVE YOU GIVEN YOURSELF PERMISSION TO BE SUCCESSFUL? The foundation of Positive Thinking is that with a clear and focused mindset all things are possible. This does not mean there will be no mountains to climb or descend.It really references the manifestation of ones truest desires when we ALLOW the possibility of them to come into being. How many times have you set out to take the next step toward manifesting what you really want and have ALLOWED it into being? Giving yourself permission to be successful might sound ridiculous, but that is the first step in making strides towards what it is you truly desire. Once we have given ourselves permission to be successful, only then can we ALLOW all the possibilities into being. Once we have given our permission and enter the realm of allowing things to happen, those mountains that seemed too formidable to climb will become the building blocks of our future success! 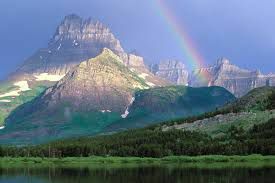 The rainbow awaits all those who give themselves the permission to allow endless possibility into their existence! Begin allowing your future today!